Having a pitcher with different pitches is one thing but understanding how to call them, which pitches to use and when to use them is completely different. Learn to avoid the biggest mistakes coaches make when calling pitches. It’s true that the better your pitcher is the easier it is to call pitches for her. But no matter how good your pitcher is – make sure you’re avoiding these Top 4 Pitch Calling Mistakes. Calling pitches is a tough job. It involves thoroughly knowing as much as you can about each one of your pitchers, as well as all of the opposing hitters and even the umpire. While we offer an eClinic that details everything you need to know in order to call the right pitches (The Art of Calling Pitches) – for the sake of this article, I want to focus on the most common pitch-calling mistakes. Random Reasoning – Basically, this means there’s no reason for calling the particular pitch – the reason is just random. I know this sounds nuts, but I see coaches do this all the time. 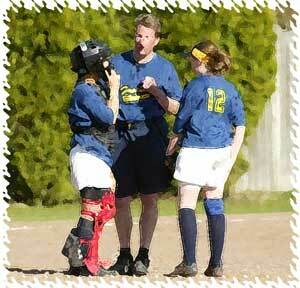 Sometimes coaches will randomly call a pitch because they “like” the pitch. It’s the wrong pitch at the wrong time from a pitcher that doesn’t really have the pitch, but the coach likes the pitch so they call it anyway. Random reasoning isn’t really reasoning at all and it sure doesn’t help put your pitcher in a position of dominance. Haven’t Thrown It In A While – This one’s a lot like Random Reasoning as it doesn’t really follow a solid line of thinking. Simply calling a pitch because you haven’t thrown it in a while is no reason to call a pitch. Pitches need to have a specific reason they’re being called – either they’re attacking a hitter’s weakness, they’re the best way for the pitcher to get a strike, they help set up another pitch, or they help the hitter hit into the strength of the defense…whatever the reason there needs to be one that’s far more specific than “we haven’t thrown it in a while”. Calling a Pitch This Pitcher Doesn’t Have – This one always amazes me. How can anyone call a pitch that they know the pitcher doesn’t even have, and yet you’d be amazed at how often it happens! Anyone calling pitches should know the pitches that every one of their pitchers have, and the order of control for each of them. Simply having this list in front of you when you call pitches will make sure you’re only calling pitches that this pitcher has. Calling a Pitch in a Location This Pitcher Doesn’t Have – Another way coaches can hurt their pitchers is a little more subtle, but still results in putting the pitcher in a position to fail – which means it’s harder for her to get ahead of the hitter. Coaches often call a pitch that the pitcher has in a location she can’t throw it successfully. The curveball is a great example of this. Many pitchers have decent curveballs on the outside corner but then the coach signals them to throw it on the inside corner (sometimes called a “backdoor curve”). This is a much more difficult pitch that when thrown well can result in jamming a good hitter. But, when a pitcher throws inside when she isn’t ready to throw there, the result is usually a hit batter if the pitch doesn’t break, or a meatball if the ball breaks too much. Both of these result in the pitcher getting into trouble when really it was the person calling the pitch that made the mistake. Calling pitches is a challenge that requires a lot of knowledge, study and adjustment. The main goal of calling pitches is to put your pitcher in a position of dominance over the hitter and keeping her there, and to help make that possible do your best to avoid these common pitch calling mistakes! REMINDER: if you’re already a Vault Classic member then you already have BOTH of these eClinics in your locker!